Transfer time from the airport: about 30 minutes or a bit less depending on traffic. 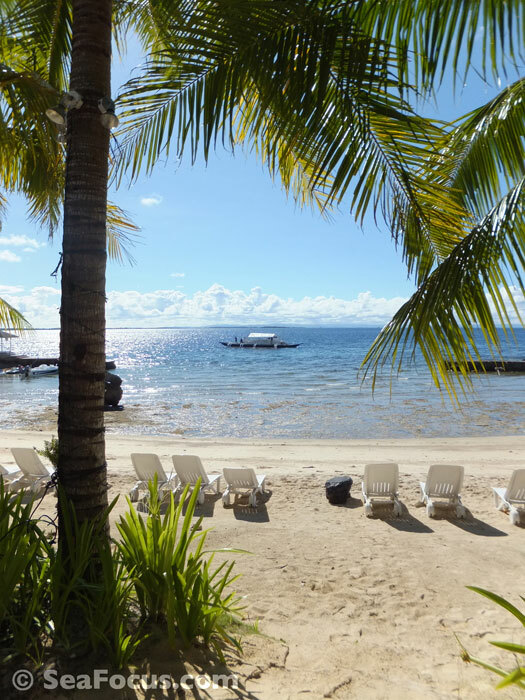 Flying into the Philippines to go scuba diving anywhere in the Visayas region will mean arriving at Cebu International airport, which is actually on Mactan Island. Mactan is actually a small island linked to much larger Cebu by a bridge. 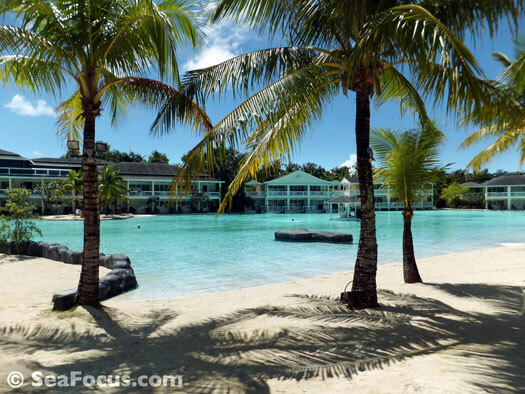 Chances are that you will need a stopover close to the airport in one direction or another and Plantation Bay Resort is ideal for that. The resort will collect you the airport terminal and although the transfer is quick, the resort is still far enough away that you don't hear the planes. 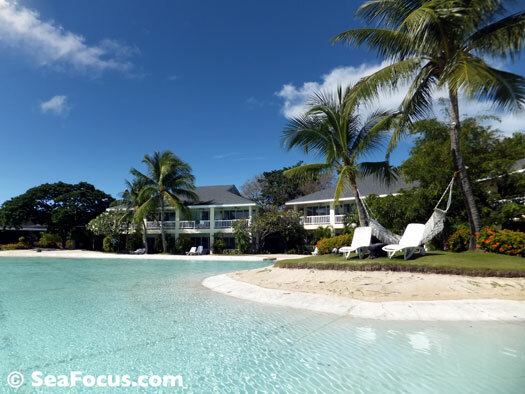 Plantation Bay is on the eastern coast of Mactan but it only has a small strip of water frontage. This has been no issue for the architects who simply designed the whole resort as a series of tropical lagoons, all of which are fed by seawater as the tides go in an out. 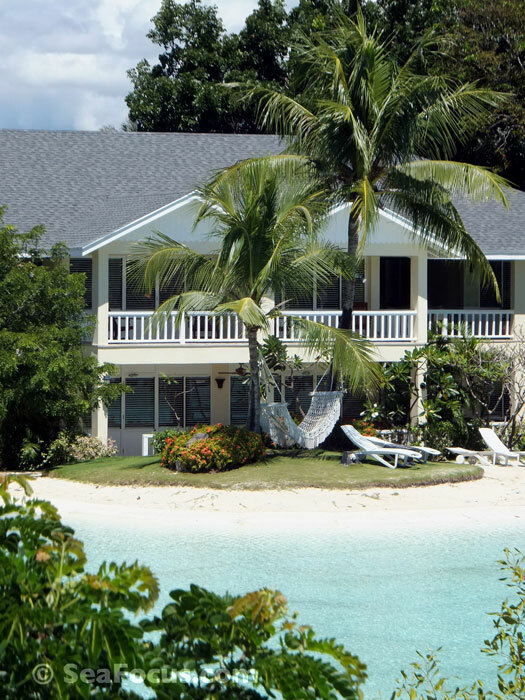 The overall effect is delightful – a large, freshwater pool and restaurant that sit in the middle of the complex is surrounded by a network of small, saltwater lagoons and man-made beaches. The concept has been further enhanced by man-made waterfalls, boulders and grottos with lush, jungle style plants including tropical flowers and palm trees. Rooms There are a variety of accommodation buildings that are named after worldwide locations – we stayed in 'Bahamas' a colonial structure with eight rooms overlooking the saltwater lagoon. 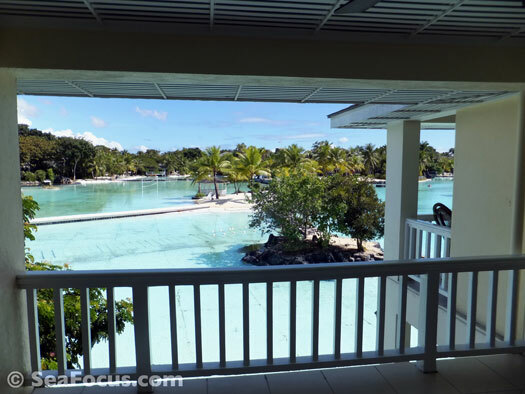 Other buildings, with titles like Seychelles and Nile are dotted around the peripheries of the lagoons so almost all rooms have a water view of sorts. Our room was large and airy with a blissfully comfortable king size, four poster bed and colonial themed decor. All mod cons (air-con, TV, coffee and tea) are in place and a really nice touch was a selection of Filipino style sweet treats to try out. The bathroom was enormous, with everything you would expect of a hotel of this calibre including some very nice toiletries. There was a large balcony at the front. Although we were fortunate to have one of the more expensive rooms, we saw one of the cheaper ones as well and it was equally nice with similar decor. Facilities The resort has four eating and drinking spots – sadly two were closed for renovation while we were there but the other two were very good – and there is a swim-up bar in the main pool. However, perhaps the best feature of this resort for anyone staying longer than overnight are the substantial number of activities on site. 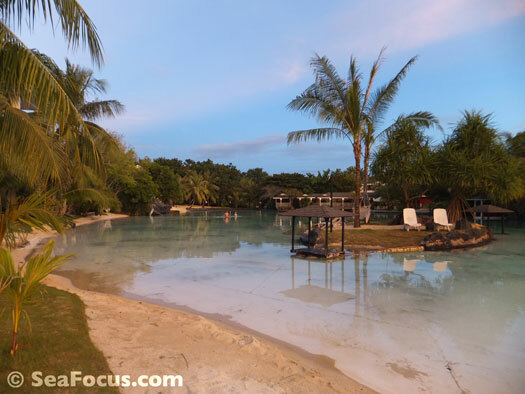 There are kayaks for the lagoons, a mini-golf course, tennis, wall climbing, a children's playground and even a firing range. There is a watersports centre on the coastal side and even diving right offshore. Unfortunately we were unable to make use of any of this with just a quick overnight stop. Value Room costs vary but the resort seemed like great value to us as a huge buffet breakfast and transfers were included. Drinks at the bar were well priced and our evening meal was suitably priced. If you were looking for cheaper (or indeed more expensive) there are a lot of restaurants nearby. 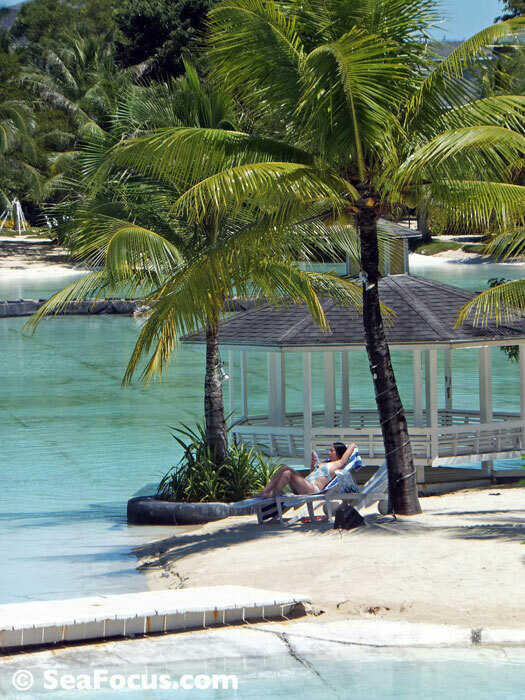 Opinion We loved Plantation Bay and would definitely go back. Service was great, rooms comfortable and the ambience was warm and friendly. 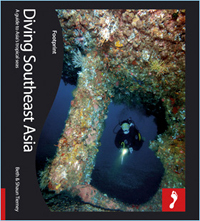 DIVE GUIDE | Complete reports on diving in the Philippines are in Diving Southeast Asia. Order via Amazon here.